Many cup and bottle styles available. Have your own? Ship it to us and we will customize it for you! Monogram, Name, Initials, or favorite saying. We will make it like you want it. Various color options and styles available in bottle and in graphic. Price includes bottle and one color monogram or initial. Contact us for additional personalization. 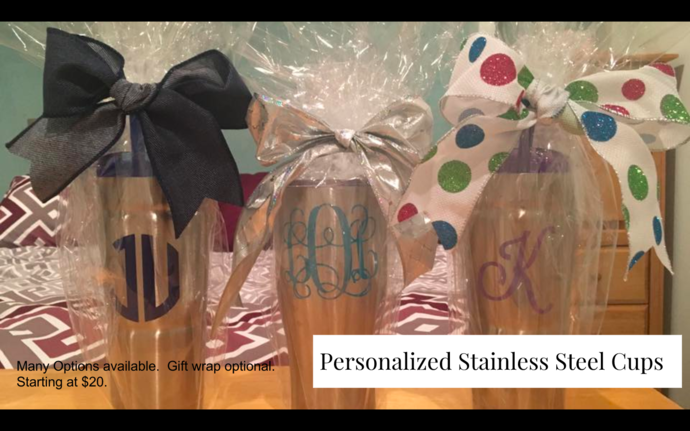 BE SURE TO INDICATE IN THE "MESSAGE TO SELLER" BOX THE MONOGRAM INITIALS or any other specifics to make your gift perfect! We love to design with you so don't be afraid to ask if we can do it.